Teaching Good Eaters: 31 Days Challenge- Day 20: Let your Kids Play with their Food! 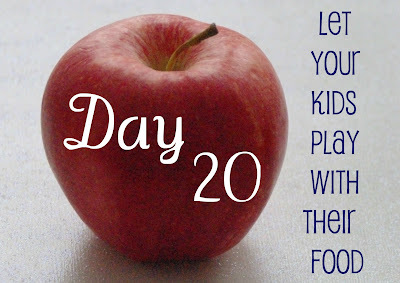 31 Days Challenge- Day 20: Let your Kids Play with their Food! Admittedly, my kids could probably work on better table manners. 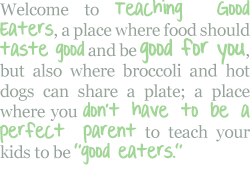 But, getting my kids to eat, is just not a struggle- meal times are fun- eating is fun- food is fun! 2. Challenge your kids to eat the whole meal with a fun utensil: chopsticks, toothpicks, tongs, pasta spoon, etc. 4. Make homemade bread and homemade butter. Let them play with some of the dough as you make bread and making butter is pure "play." This would be a great way to get kids to try whole wheat bread! 6. Make asparagus and let the kids "sword" fight before they eat it! 9. Put food on a flat plate and let the kids pretend they're dogs eating with their mouths only. 10. Give your kids a variety of foods and let them, "build." Perhaps you can challenge them to make a face, or make a tower. 11. Make homemade microwave popcorn and then play a game trying to toss pieces into a bowl. What fun ideas do you have for "playing with your food?" Love your ideas! I am kind of lax on table manners. We LOVE to play with food at our house. 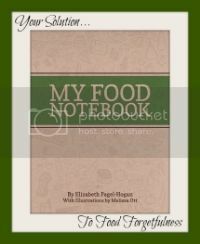 Thanks Keitha... your playfulness with food definitely "shows" in all of your fun story themed meals! Great Post! I also think playing with food is a good thing...I guess that's why I love character bentos so much...they're like toys you actually get to eat!! 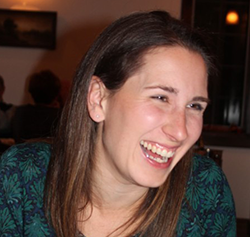 Thanks Lindsi- I love your link-up and actually had linked another post, but I'll stop back and link up this one, as well. Thanks Sherri- I stopped by your blog and saw some great ideas too... I'm going to have to stop back later and "hang out" for a while!" 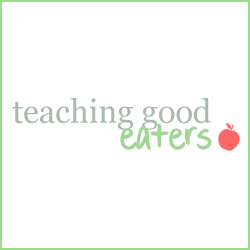 Very cool - I love that you are encouraging good eating habits through play. Food should be fun! Eating should be fun! The asparagus spears as swords idea is a stroke of genius! Thanks Alec... I'm not sure that I can take credit for the Asparagus "swords." When you have boys in the house and you let them eat asparagus with their fingers, some things just happen organically!